There is a popular phrase: “Timing is Everything.” The theme has been applied to a variety of topics, but it is very appropriate for photography. 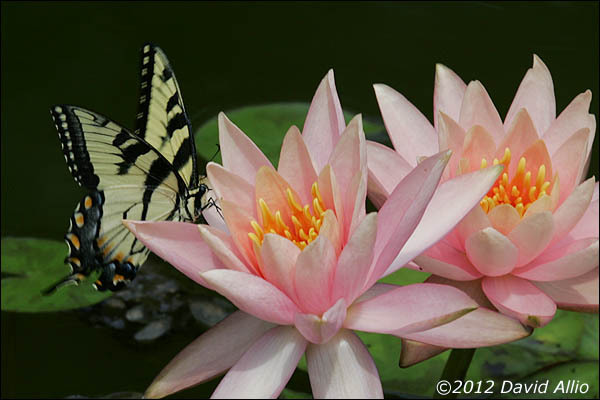 Although I was attempting to compose a creative image of two water lilies in bloom, this butterfly stopped for a very brief visit – less than a quarter of a second to be precise. When wild creatures are involved, the photographer’s reaction must be compose and capture. The composition may not be perfect, but there are very few second chances. After the butterfly left, I had the luxury of time to compose a variety of interesting photographs of the blooming water lilies. But, the butterfly never returned. This exposure information for this image is an aperture of f/11 at 1/160th of a second with a film speed of 100 ISO. The hand-held exposure was made with a digital 200mm (effective focal length of 260mm) lens without the assistance of image stabilization or vibration reduction technology. Flowers are one of the most popular gifts for Mothers Day. Cut roses have been traditional, but this year it seems that there is a greater selection of live flowers available – especially orchids. The Orchidaceae family of flowers consists of thousands of natural species, with new hybrids being developed by breeders. 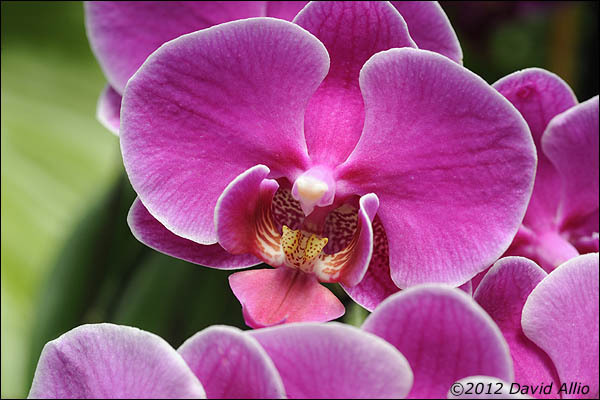 Although considered a tropical flower, orchids may be found in a diversity of climates. The photograph of this dark purple hybrid Orchidaceae Phalaenopsis was created using a Nikon D3 camera body fitted with a Nikkor AF 60mm f/2.8D Micro lens. Creatively, depth-of-field was a significant consideration, so an aperture of f/13 was selected. The shutter speed for the hand-held exposure of 1/60th of a second required a film speed of 1000 ISO under overcast skies. Orchids are a compelling subject. An ordinary composition places a single flower in the center of the frame. This image made use of a group of flowers to create a composition line in the bottom one-third of the frame to support the main flower. In just a few days residents of the Earth are expected to see a Super Moon, according to reports from NASA. 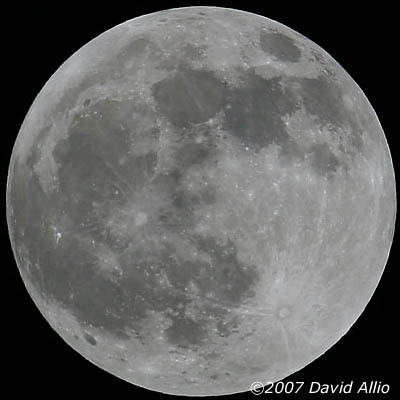 The full moon on May 6 is supposed to be 14 percent larger and 30 percent brighter than the average full moon. At perigee the lunar mass will be 356953 km from the Earth, making it the closest passing of the two masses for the 2012 calendar year. Every Full Moon, or for the occasional lunar eclipse, there are a bunch of lunatics who drag their cameras and telephoto lenses out of the bag without ever thinking about the subject. The Moon is a gray rock surrounded by a black void of space. The proper exposure and color balance for a Full Moon is exactly the same as for daylight on the Earth. Cameras with built-in exposure meters usually get confused by the stark contrast between the reflected light of the Moon and non-reflective surrounding space. In most situations, a camera meter will try to balance the quantity of light and provide a reading that varies anywhere from two-to-five full f/stops. The smaller the Moon is in the frame, the greater the amount of probable exposure error by the meter. Atmospheric conditions greatly affect the basic exposure calculation. Smog can affect the color temperature as well as reduce the amount of reflected light by one or more f/stops. Haze and clouds may have an even greater exposure impact. When selecting shutter speeds, it is important to remember that the Moon is moving at a speed of over 2200 miles-per-hour. That movement will appear as blur when slower shutter speeds are selected. The technical exposure data for this full lunar eclipse as seen from Puhi, Kauai, Hawaii, on Monday, August 27, 2007, is an aperture of f/8 and a shutter speed of 1/400th of a second at 100 ISO. The 560mm (720mm digital) focal length lens was supported by a monopod.